With the Synergy3D Series, you'll enjoy incredible energy savings on your heating and cooling costs while providing hot water for radiant floor heat. 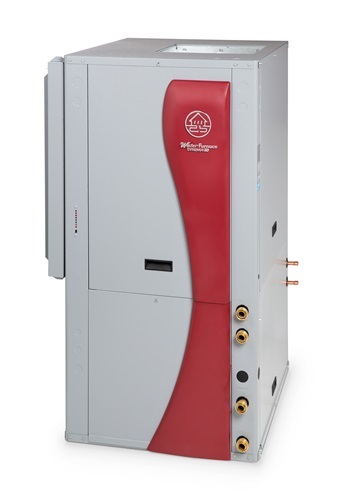 The Synergy3D is the geothermal equivalent of a boiler, furnace and air conditioner—all in a single unit. Units are available in four vertical sizes. Heavy-gauge metal cabinets are coated with a durable metallic finish for long lasting beauty and protection. Copeland dual capacity scroll compressors provide outstanding performance and reliability, while coated air coils add durability and longer life. Synergy3D units utilize ozone-safe R-410A refrigerant. Variable speed ECM blower motors are used for quiet operation. A sophisticated microprocessor control sequences all components during operation for optimum performance, and provides easy-to-use troubleshooting features with fault lights and on-board diagnostics. To help achieve ultimate comfort, heating priority may be given to forced air zones or radiant floor heat. The Synergy3D was designed to combine the comfort of radiant heat and the efficiencies of forced air. Whether you choose to use radiant heat in small zones like bathrooms and the kitchen, or in larger zones like the basement floor, the Synergy3D delivers. Use in combination with our WaterFurnace GeoTank. The GeoTank is simply the best way to capture preheated water from your unit. Engineered specifically for your WaterFurnace geothermal system, the GeoTank includes unique features that make installation and operation easy.